The National Conservation Strategy for the Great Green Macaw in Ecuador, which was reviewed and revised in 2009, includes as one of its policies, the implementation of projects for research and monitoring of populations of this critically endangered species in Ecuador. While work has been done to monitor the local population in and around the Cerro Blanco Protected Forest as well as some forest remnants on private property in the Cordillera Chongon Colonche, no effort has been made to carry out a census of other populations in the species’ range in Ecuador. Based on the experience acquired in a bi-national census of the same species carried out in Nicaragua and Costa Rica in 2009 and with the support of the Mohamed bin Zayed Species Conservation Fund, the census was organized and carried out in the provinces of Esmeraldas, Santa Elena and Guayas. 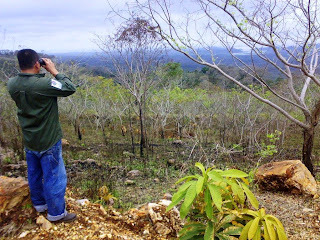 Observers were positioned at strategic sites where macaws have been recently spotted, from 6 AM to 7 PM on December 21, 2010. Participants included park guards of the Pro-Forest Foundation in Guayas Province, forest guards of the Project Chongon-Colonche of Fundacion Natura and staff of the Jocotoco Foundation at the Rio Canande Reserve in Esmeraldas Province. A total of six Great Green Macaws were spotted on December 21st, including five individuals in the Bosque Protector Chongon Colonche and one macaw at the Hacienda El Molino, near the Cerro Blanco Protected Forest, by a group of biologists of the Consejo Provincial del Guayas. The Jocotoco Foundation reported that days before the census, two macaws were seen at Rio Canande. The overall population of Great Green Macaws in Ecuador is estimated at between 60 and 80 individuals, so this census only scratches the surface of the potential population that exists. We hope that this year with more time and the support of the authorities, that we can extend the census to more areas in the range of the Great Green Macaw in Ecuador. My feeling is that this population estimate is perhaps overly optimistic, as the twin threats of deforestation and capture of macaws for the pet trade continues in Ecuador at a rapid clip.